T-Mobile today dropped its Q3 2017 earnings report, revealing that it’s extended its streak of consecutive quarters with more than 1 million customers added. T-Mobile says that it added 1.33 million customers in Q3 2017, making that its 18th straight quarter of adding more than 1 million customers to its network. Of that 1.33 million, there were 817,000 new postpaid subscribers, 226,000 prepaid adds, and 286,000 wholesale adds. At the end of Q3 2017, T-Mobile served 70.73 million customers. Both postpaid and prepaid churn grew from Q2 2017 to Q3 2017, with postpaid churn increasing to 1.23 percent and prepaid churn growing to 4.25 percent. On the financial side, T-Mo reports that Q3 2017 saw year-over-year increases in total service revenues ($7.6 billion in Q3), total revenues ($10.0 billion in Q3), and net income ($550 million in Q3). T-Mobile also touched on its network today. At least 10MHz of 600MHz spectrum covering 1.2 million square miles will be cleared and ready to deploy in 2017, T-Mo says, and more cities are expected to gain 600MHz coverage this year. 600MHz service is currently live in Cheyenne, Wyoming and Scarborough, Maine. A new 600MHz-compatible device is coming this holiday season — rumors say it’ll be the Samsung Galaxy S8 Active — joining the LG V30 in letting customers use that new 600MHz coverage. The majority of devices launched in 2018 are expected to be 600MHz compatible. 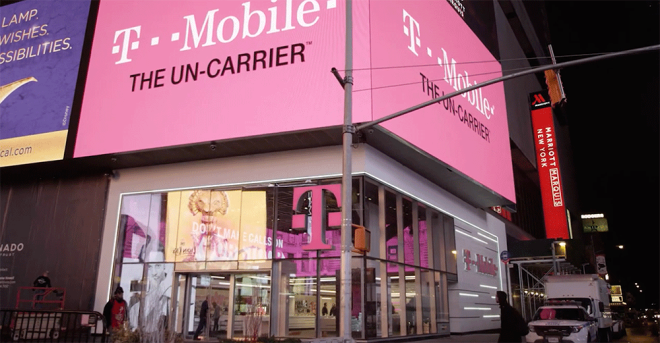 T-Mobile’s 4G LTE network currently covers 316 million people, and T-Mo aims to grow that number to 321 million people by the end of 2017. One other detail worth noting is that unlike in most other quarters, T-Mobile is not holding a live call to discuss its Q3 2017 results in greater detail. That may be because of the rumors that T-Mobile and Sprint are close to announcing a merger and so many questions that’d likely be asked during a call would be related to that deal, which T-Mo wouldn’t be able to answer. Sprint is also skipping a conference call when it announces its next quarterly earnings on October 25th. 18 straight quarters of taking increasing market share. T-mobile is a poster boy for not allowing companies to merge and becoming behemoths like AT&T and Verizon. Under no circumstance should FCC and FTC allow Mr. Son of Softbank Japan to merge Sprint with T-mobile. If he is unable to compete, he needs to put Sprint for sale, but not allow reduction in competition. The US wireless users already pay a ton of money compared to Asia and Europe. This is not the time to make the US market even more concentrated. Most paid lobbyists were saying if AT&T was not allowed to buy T-mobile it would go bankrupt. Now the same paid shrills are back to say the same for Sprint. Sprint is hemorrhaging $, they need to do something. Sprint stock will go down and some one will pick up the company for a song. Mr. Song failed to turn around this company so he is trying to praise Trump and try to merge with T-mobile to make a profit for the Japanese Softbank investment. I doubt the regulators will want to reduce competition and result in increased prices for US consumers. With just a year for the next elections, very low chance of political support at this stage. Just my opinion, but if the regulators want to increase competition in the marketplace they should look at breaking up Verizon and ATT rather than preventing a merger that would result in a smaller company in subscriber base, revenue, and profit. Sprint’s pricing promotions have amounted to trading net worth for subscriber count and are unsustainable. At this point they appear to be a false competitor in the market and, again IMO, will run out of asset value to leverage soon, reducing the market to 3 irregardless of regulator intervention. Comcast is starting a “cellular service”. Seems to me that they’d be a perfect fit. Then T-Mobile could merge with Dish. ATT is already doing this since they were allowed to purchase Directv. IMO ATT is the bigger threat to a monopoly. Regulation in broadband is what got us in the anti competitive mess we are in. Its local exclusivity agreements that got us in the anti competitive mess we are in. Antitrust federal regulation would help solve that; however, the “deal seeking” states/cities” that signed these deals have essentially screwed themselves out of competition. How can regulators break up Verizon And ATT? They did it before when it was all landlines,tell them have to bring back all the smaller cell companies they ate? Not trying to bash you or anything I just don’t see how they can do it. I’ve been think about this for a while. Both Verizon and AT&T should be forced to give up a third of their companies which will be merged into a fifth national carrier. So why can’t Tmo pick it up for a song now? Because T-mobile is not picking up anything. The two companies are merging and Sprint directors will also serve on the combined company. Excellent so this way it is free. Exactly, in addition, I do not want all of the Sprint customers slowing down our T-Mobile network. John, just tell Sprint to go away! Sprint would bring it’s spectrum with it. There shouldn’t be a slowdown. There should actually be an increase in speed over time. It’s still a bad deal and should be blocked though. Glad to see the growth still moving in substantial numbers, but I’m curious how many of these “new customers” are really new vs people adding 2nd lines for all their buy one get one offers. Still money it T-mobiles pocket at the end of the day, but I know several people with multiple unused lines simply because it’s the only way to get a deal on a new device. Glad to see Legere riding high on the tailwinds of the Obama economy. That’s all about to change though ‘bigly’. I suppose you’re right n way. One can only imagine since what you describe doesn’t exist. Trump has been doing incredible. It is just leftists are too angry to see it. I think it is part of Trump’s plan to distract the low information types and media with tweets so they don’t complain when he enacts his agenda. Just today limits on job killing hub visas. MAGA. LOL, so good that now they’re thinking about imposing a 40% Fed tax increase on gas and facing a 20% increase to healthcare plans. This is winning? So T-mobile is having record earnings and had to do away with Mobile without boarders due to costs???? What? The only change has been unlimited data in mexico and canada becoming 5GB, which is generous at worst. Simple global (mobile without borders) is still in full effect. This is actually great for Tmobile customers. More spectrum and more phone models. ATT and Verizon will always be more expensive with crappy service. If all they wanted was spectrum then Dish would be a far better pick. This is about customers. One merger that would nearly double their customer base overnight. Awesome, now T-Mobile can beat Sprint’s offer of $350 off the iPhone X with a trade in of a newer phone-iPhone 7 and 7 Plus, iPhone 6S and 6S Plus, iPhone 6 and 6 Plus, Samsung Galaxy S8 and S8 Plus, Samsung Galaxy S7 and S7 Edge, Samsung Note 5, LG G5, LG G6, LG V20, Google Pixel, Google Pixel XL, Moto Z Droid, Moto Z Play, Moto Z2 Force, Moto Z Force Droid, Moto Z2 Play, BlackBerry KeyOne, and the HTC U11. Hmm churn is up. Time to make a deal with Sprint. nope. We should not allow reduction in competition under any circumstance. t mobile rocks we dont need sprint.